Guest post by Christine at What's Up Cupcake? 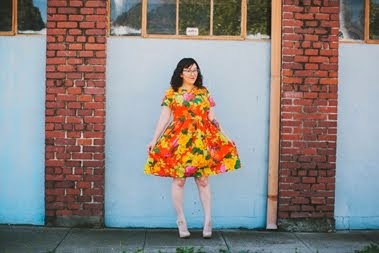 One of my favorite bloggers, Christine from What's Up Cupcake, sewed up the cutest Hazel dress and I have been dying to share it with you. Not only is it super adorable, but it's based on one of Lady Mary's dresses from Downton Abbey who I love! Hopefully, you can gather some inspiration from Christine and Lady Mary while you are working on your own dresses. Thanks for sharing with us, Christine! Hello everyone! Christine here, from What's Up, Cupcake? Blog. Can I tell you how excited I was when I saw the announcement for Sew Colette 2? I participated in making a couple of the garments from the first round, but can’t wait to create even more with their pre-packaged patterns, many of which I’ve already made a couple of times. They’re just so easy to work with! 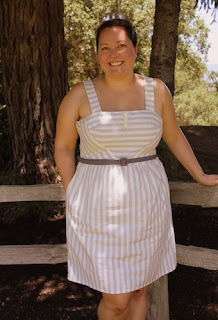 Today I’m sharing with you my version of the Hazel dress and the first pattern in this round of Sew Colette. I was so eager to get my hands on this pattern as I had big plans in store for it. Big. HUGE. 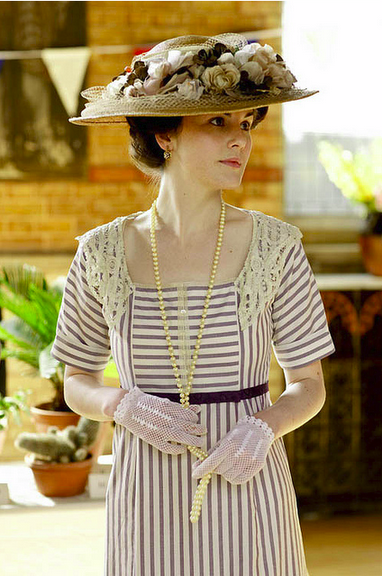 I’m a total Downton Abbey junkie, and had been looking for a dress shape to make into a modern version of Lady Mary’s garden party dress. 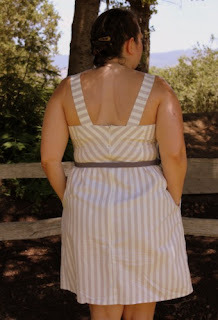 I wanted to replicate the various angles of the stripes (see the bodice front – they’re both horizontal and vertical) and in the back they were diagonal. There is also a contrasting band on Mary’s dress, so I decided to replicate the look with an optional belt in dark grey. The thing I love about Colette patterns is that I don’t usually have to make any fit adjustments. Her patterns seemed to fit my body shape perfectly, so I assembled the dress exactly as described in the pattern directions. The only change that I made was in the direction of the stripes. For the back of the dress, I carefully laid out the back pattern piece so that I would have the stripes angled in towards the center back of the dress. I also played around with the direction of the stripes for the strap, eventually settling on the horizontal direction so that they matched the striped running across the front of the dress. I made the belt using Sunni’s belt kit. It’s so easy to use and can be a great accessory for any of your custom creations. The last feature that I added was really the finishing touch, that made it the ‘Garden Party dress’ in my eyes. 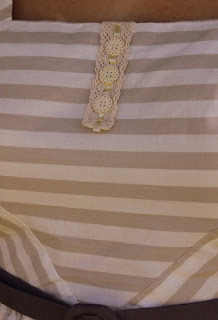 I added a strip of lace to the front bodice with three vintage buttons running down it. I love the versatility of this dress. I’m thinking of playing with a variation of the straps for Sew Colette 2, and using a printed fabric for a different look. What’s going to be your take on Hazel? very cute dress! I like the stripes manipulation--bravo! I'm thinking about using a little piping to add some more color to my hazel. and perhaps a belt is in order! my fabric is white with very small green threads, and I think I'll like it better if I can add in a little more color. The piping will be perfect then! I love the garments you make, Christine, and this Hazel might be one of my favorites. Isn't she great? Whenever I see her projects I get jealous and want to make one of my own! Very nice. I love the neutral stripe on white.